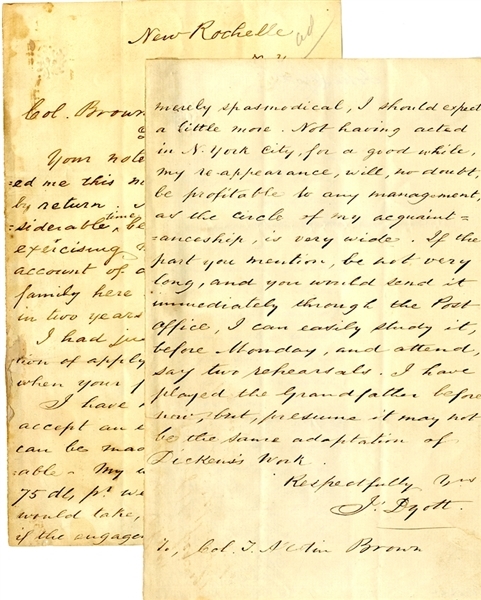 Autograph Letter Signed by John Dyott, who had been on stage in Act Three, Scene Two when John Wilkes Booth assassinated Abraham Lincoln, 2pp. octavo, New Rochelle, New Yok, October 4, 1870, addressed to Colonel Brown, pertaining to employment: “My usual salary is 75 dls pr week, and that I would tak, if permanent, but if the engagement proposed be merely spasmodical, I should expect a little more. Not having acted in N. York City for a good while , my reappearance will no doubt be profitable to any management as the circle of my acquaintanceship is very wide...” Very good condition.